1. one hand pulls one zipper side downward to stabilize it while the other hand connects the slider. 3) Some jackets have 2 sliders, one above the other. I suggest not buying those! 4) Sometimes the tab to pull is very small, but we can always attach an object to make it larger, or tape to create color contrast. 5) Zipping takes good bilateral coordination as one hand pulls downward while the other pulls the zipper upward to close. 6) One needs to have good strength and coordination between the “tripod fingers” index, middle and thumb in order to squeeze that tab while pulling upward. I like adapting teaching materials so that the most difficult aspect can be repeated several times. Connecting the slider to the zipper is a splinter skill, but a necessary one in order to zip independently. Since people normally zip once when needed and are usually eager to go out rather than struggle, I thought that maybe the following activity would remove the stress and enable practice. I bought the zipper repair case shown above at a craft’s store. It cost $10.99 and came with 8 sliders. There is the option of collecting old clothes and removing the sliders. 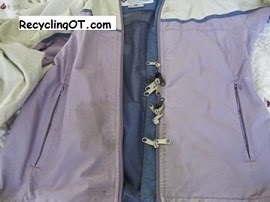 One also has the option of throwing out a perfectly good but very stained windbreaker as shown in the photo. I cut off the sleeves so that any person of any size can fit in it. The person has the option of zipping it closed after practice time. The activity can be performed by teaching how to zip the sliders up or removing them to put into the pocket-thereby practicing opening and closing the zipper on the pocket. The person you are teaching may learn how to attach the sliders and still have difficulty zipping his or her jacket, but its a good start in developing the motor planning needed to zip one’s own clothing. About the Author (from her website): I am the author of The Recycling Occupational Therapist. This is a guide to making activities for individuals with developmental disabilities. Her latest book – From Rattles to Writing: A Parent’s Guide to Hand Skills is published by Therapro, Inc. This book is primarily written for parents of typically developing children to teach them how to provide the early sensorimotor experiences that lead to reading and writing. However, it is packed with activity adaptations designed to help children with learning challenges. Barbara is also the creator of the fine-motor activity Weavable Toys. 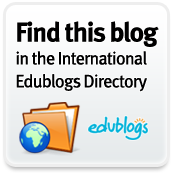 This entry was posted in OT and tagged 16 May 2014, ADLs, Article, Newsletter, OT. Bookmark the permalink.